Mudu in China to deploy over a hundred LiveU Solo live streaming units. 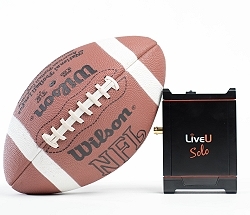 Hackensack, N.J., March 2017: LiveU has announced a new deployment of the LiveU Solo plug-and-play live streaming solution in China with over a hundred units to be used initially by Mudu, the country’s largest live video platform service provider for the enterprise market. Mudu will supply LiveU Solo to its broad enterprise customer base, including photographers, large media groups’ subsidiaries, and telecom, mobile and internet service providers. Mudu will offer its customers a dedicated Solo portal for the Chinese market building on its existing support for China’s top social media and online video platforms, such as Youku, WeChat, Weibo, and DingDing. Mudu offers its customers technical support and a suite of cloud-based online production and content distribution services, including online branding, online video switcher, switch playout, local insertion, real-time editing, time delay and data analysis. Mudu also has its own service network, providing a turnkey solution for live event coverage. Solo will provide high quality video to all major distribution channels in China. Built on LiveU’s proven bonding technology, Solo is the streaming solution of choice for major online media companies worldwide. Solo allows users to live-stream seamlessly directly to Facebook Live and other popular social media and online video providers. Solo is simple to manage and control remotely via a web interface or smart device.